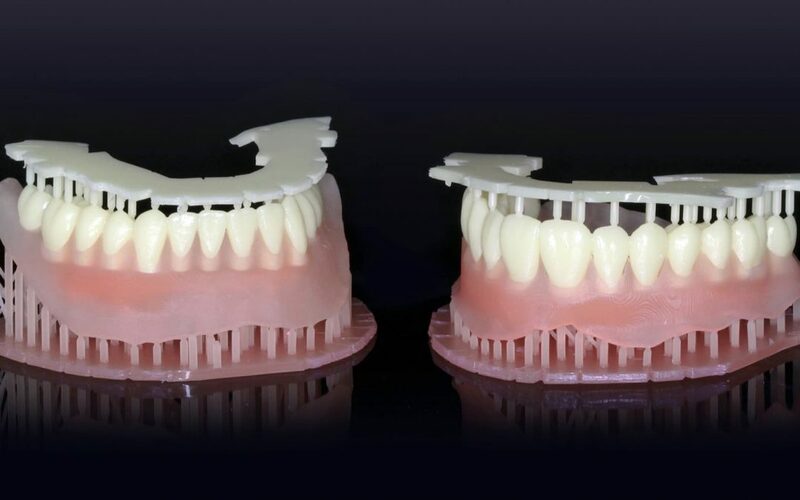 Dentca, a dental laboratory, received its first clearance from the FDA for a 3D printed resin that can be used as a base material during the manufacturing process for dentures. This is a huge step in the regulatory world because it is accepting 3D printing as an approved method of manufacturing medical devices. The denture fabrication process begins with creating an impression in the dentist’s office which is then sent to a dental lab for conversion into an optical impression system. Afterward it is made layer-by-layer in a stereolithographic laser printer. Once the plastic teeth are attached the denture is cured in a light chamber and sent back for any final adjustments. Manufacturing dentures manually has become very problematic because they are time consuming and are prone to having a margin of error since they are handmade. In addition, the shape of gums may change drastically over time while the denture is being processed causing discomfort and patient visits for adjustments. By using the CAD and CAM systems, DENTCA can reduce the time and cost of manufacturing dentures and decrease the number of patient visits to 1 before the final denture delivery. In addition, the new clearance has revolutionized the denture manufacturing process making it possible to 3D print dentures in the office itself in the span of a day. As a result, dental hardware, materials and components enabled by 3D printing will reach an estimate of a $2 billion market in 2016 and reach almost $3.1 billion by 2020.